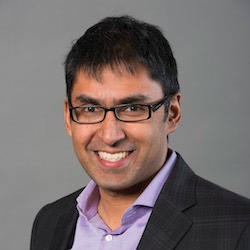 Dr. Kumanan Wilson is a specialist in General Internal Medicine at The Ottawa Hospital, and holds a Research Chair in Public Health Innovation from The Ottawa Hospital, the Department of Medicine and the Ottawa Hospital Research Institute. Dr. Wilson’s current work focuses on public health innovation including blood safety, immunization and newborn screening. He also maintains an interest in health ethics, law and policy. The overall vision of Dr. Wilson’s research programs is to bring data to patients, clinicians and the public. Realizing this vision will improve the health system and the experiences of those in it. As founder of the Ottawa Hospital mHealth Research Team, Dr. Wilson leads a dynamic, talented group of young and experienced developers, researchers and creative minds who are invested in working with leading scientists and clinicians to improve health care. Their work has led to the creation of mobile Canada’s national immunization app - CANImmunize. Other mobile health initiatives include a stroke recovery app, a tablet-based phosphate management tool, and an app for emergency room physicians. To complement his team's efforts in digital health technology, Dr. Wilson brings expertise in developing Big Data research programs for transfusion medicine, vaccine safety and metabolomics as well as experience in health ethics, law and policy. Dr. Wilson has most recently received funding from the Bill & Melinda Gates Foundation to develop alternative methods of determining early child health outcomes through analysis of newborn heel prick blood samples. This work will provide information that could guide the care of newborns in low resource settings. Wilson K, Atkinson KM, Deeks SL, Crowcroft NS. Improving vaccine registries through mobile technologies. A vision for mobile enhanced immunization information systems. Journal of the American Medical Informatics Association. 2016. 23(1):207-11. doi: 10.1093/jamia/ocv055. Fell DB, Platt RW, Lanes A, Wilson K, Kaufman JS, Basso O, Buckeridge D. Fetal death and preterm birth associated with maternal influenza vaccination: systematic review. British Journal of Obstetrics and Gynecology. 2015; 122(1):17-26. doi: 10.1111/1471-0528.12977.